– Meals: Ayam Betutu khas Gilimanuk in Nusa Dua and Bambu Sari in Kuta. 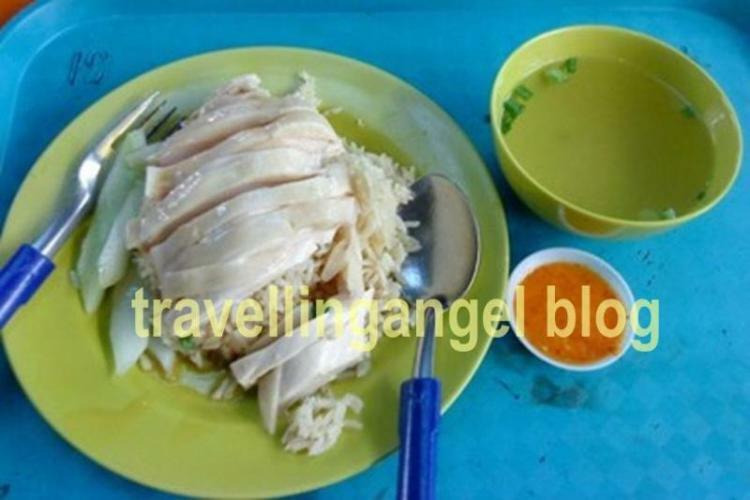 – Meals: Tian-tian chicken rice in Maxwell Hawker. It is a nice hotel, old but the garden is very beautiful. I love the pool. Breakfast is standard, my standard room is also very standard but very big.. I like my stay there. 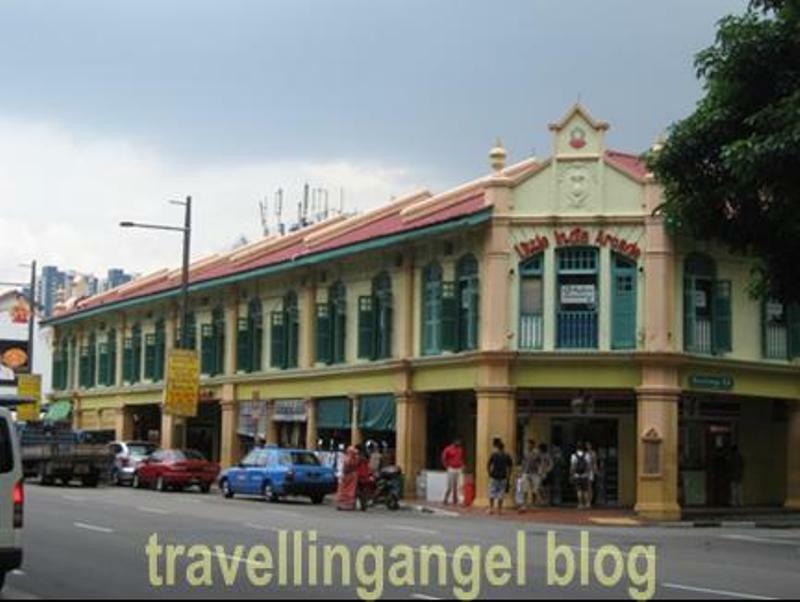 *A Beary Good Hostel, Pagoda Street, Chinatown = S$26/nite/bed include breakfast, free internet service. They have 2 dorms with 10 beds & 12 beds. 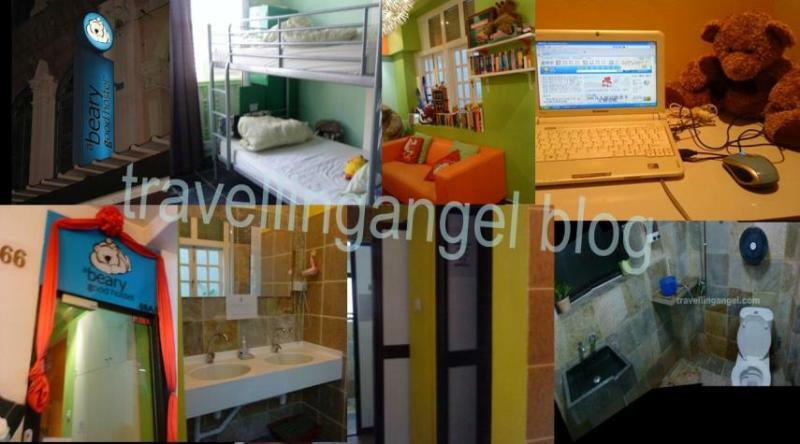 I booked through HostelBookers.com. They give the best rate than others. I really enjoyed my stay here. Everything looks nice and clean. Perfect location. They provide the netbook with free internet. Don’t forget to bring your padlock for the locker. – Card = S$12, non-refundable deposit is S$5. got free sms local/global and I used it to call to Indonesia using 018 code many times and I still have balance around S$5 until now. *Bak kwa = about S$25 for 0.5kg . I got discount when I came so I paid S$21.85 for it. *key chain = 11pcs for S$10, there is also 30pcs for S$10 in front of my hostel. This time, I went to Bali with my family. We arrived at Ngurah Rai Airport almost midnight and we were lucky that Hotel Kusnadi provides Airport Transfer for free (airport – hotel only). Kusnadi Hotel is located in Jl. 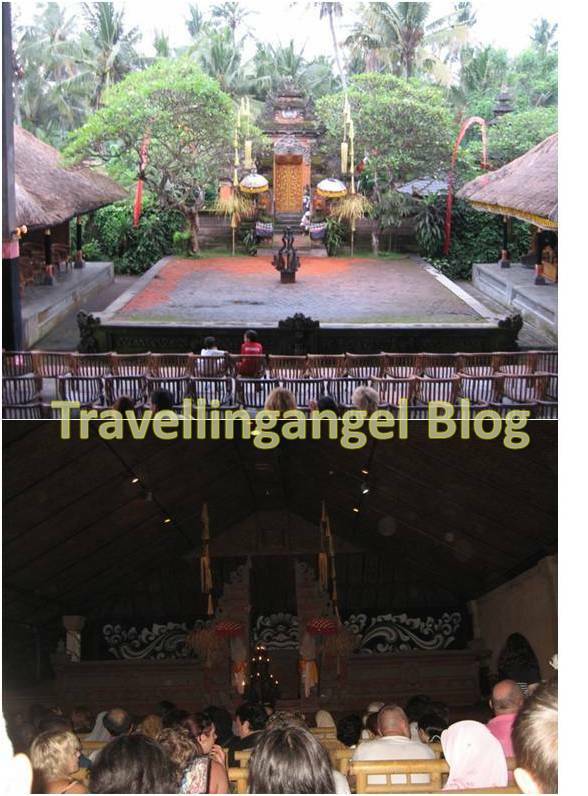 Werkudara, Legian, near Jayakarta Hotel and Double Six area. When we arrived at hotel, the staffs greeted us politely and brought our luggage to our rooms. We had 2 standard rooms. Mine was very standard, with a very large room, flat TV and a cupboard and a very large bathroom. My mom got a better room, I think that was a deluxe room. Her room is smaller than mine but the furniture etc looks better than mine. The weird thing is that they put the cupboard inside the bathroom..
Well, after putting my luggage and bought some water supply, my sister and I went to check out the clubs at Double Six. It was Friday nite and the crowd wasn’t much except at Cocoon Club. But Cocoon Club looks very exclusive and it’s an outdoor club, so we just watched it from outside, then walked back to our hotel for a good nite sleep. We woke up quite late then had my breakfast. The buffet breakfast was okay. There are fried noodle, bacon, potato, cereal, fruits, breads and juices. You can order omelet too actually. That morning I realized that Kusnadi Hotel actually looked very standard. It’s kinda old but their garden and its arrangement are so beautiful. The walk path to my room is like a maze, but for me, it is very good landscape. 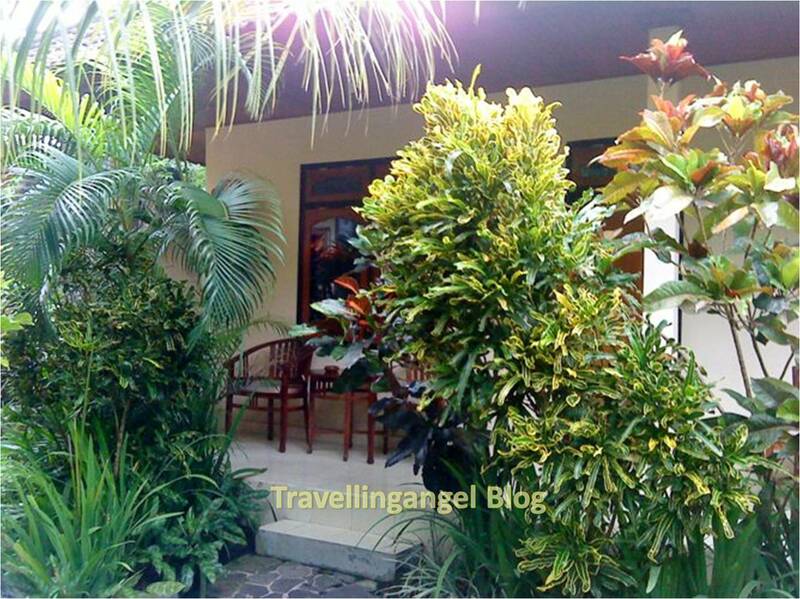 Separating about 2-3 rooms from other by the garden, just like giving the guest private space. After breakfast, I walked to Legian Beach for a quick feeling of the morning air breeze there while waiting the rental car came. It was a very nice feeling seeing all the people there jogging, playing with the water or taking their dog for a walk. After meeting with the driver arranged by Jack, a rental car agent I got from Kaskus (Indonesian Largest Forum)., we started the tour. It was the first time for some of my family members to visit Bali so we did kinda normal tour. 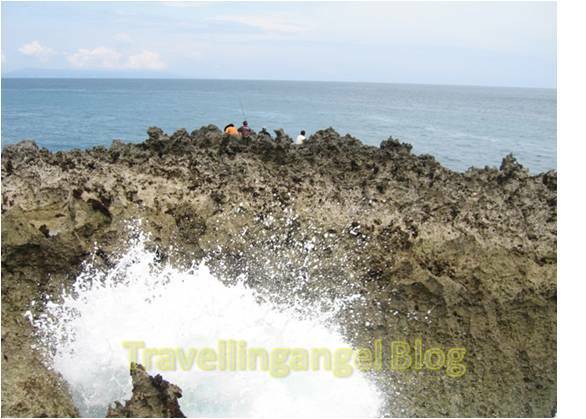 Our first destination was Tanah Lot. It took about 30min from Legian. We took some pictures there from the hill with Tanah Lot temple as background, then did some shopping. My target to shop there is always ‘Kain Bali’ / sarung bali near the entrance gate. The display is good and many variety of design so easy for me to choose. 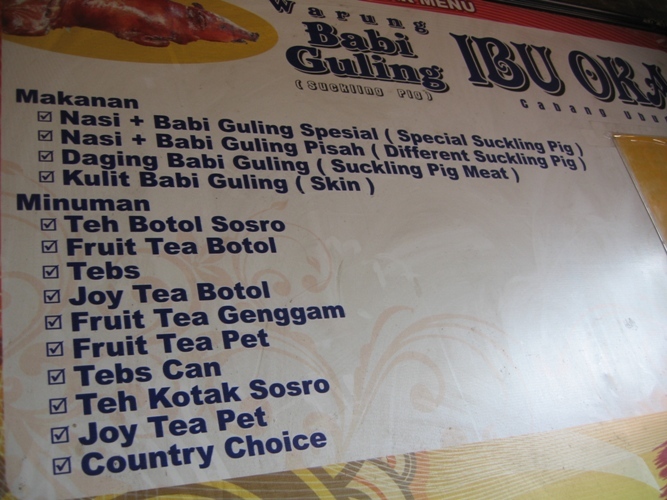 After that, we took an hour drive to Ubud to taste the famous Ibu Oka Suckling pig. The resto was very crowded. 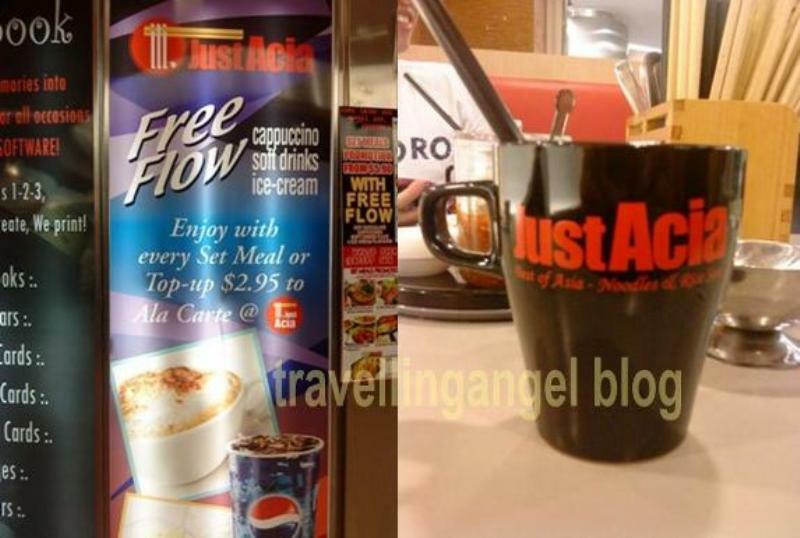 We waited for a while to get a seat and ordered the complete set and the taste.. hm.. I think the first time I ate it is better. Some meat looked still raw too. My friend told me that it was best to come there around 11am or after 14:00 because they cook it well/not in the rush. Next time, I will follow his advice. 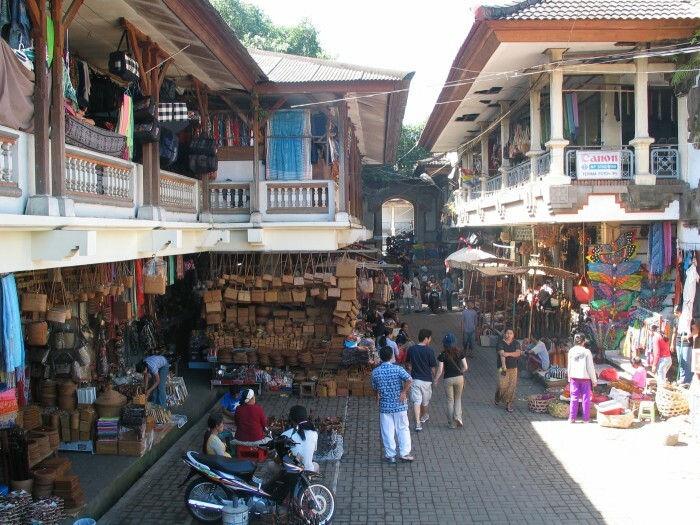 After lunch, we took a little stroll to Ubud Art Market and surroundings. I got some cute bracelets which seem popular souvenir these days. 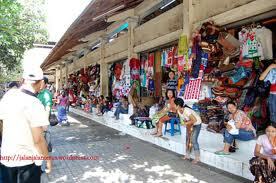 Then, we went to Sukawati Market to buy more cheap souvenirs. My mom and I got some cheap clothes and sandals.. I like shopping there, they can give you good price, as long as you can bargain well. After Sukawati, we went to Celuk to a Silver Shop.. Local tourist can get very good discount ^^/ but still expensive for me ><” . And at last, we visited Batubulan to watch Kecak Dance. This is my first time seeing it. I preferred watching it in Uluwatu though but it was rainy days. In Batubulan, we can see Kecak Dance indoor. It is something rare watching Kecak indoor since it involves fire and smoke etc but I like the show. The costumes and dances are very beautiful. Although, eventually everyone smelled like just got burn or something. I would love to see it again. After Batulan, we had dinner at Solaria in Carefour Denpasar and had quick shopping for water supply in the mart, then we went back to hotel. It was a long day! Kanaka Ocean watersport operator in Tanjung Benoa. It was my first 2 dives after getting OW License so I was very excited. The operator picked me up at 9am. Soon after arriving in the site, I was introduced to my Dive Master, Mr. Roro. He is a nice guy. We had our first dive in the site offshore, far from the regular introductory site. I got some worry that time because there was something wrong with the regulator and my weight belt was not even. I realized I didnt pre-check my equipment. My instructor would be really mad if he found it out. Well, I got my lesson. My buoyancy was off and I hit some rocks, got my first diving scars after 8 safe-dives… so stupid. Anyway, I know I still have a lot to learn and I should be more careful next time. 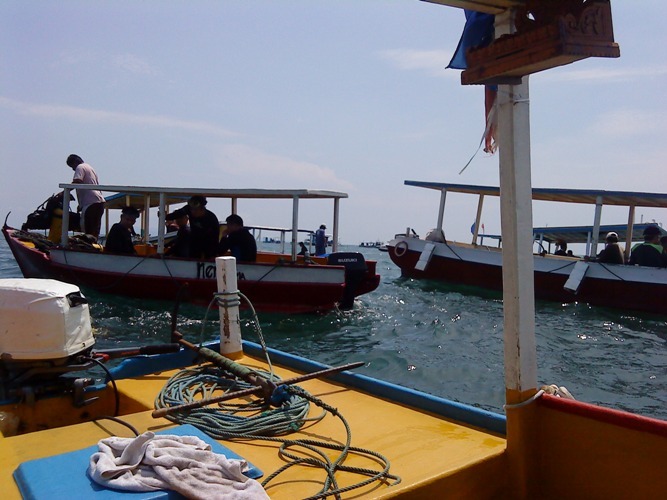 As for Nusa Dua dive sites, it is better than Sanur. No big current. The first site I went has many fishes but the second one, there are many big fishes there (aka people). I only dived short time there because suddenly the visibility went bad (only 2m). This day, I also rented a car but using Orchid Travel service. The car picked up my family first and next me at the watersport site, then we went for Lunch at Ayam Betutu gilimanuk, near Nusa Dua area I guess. We ordered the Deep Fried Chicken (whole chicken). 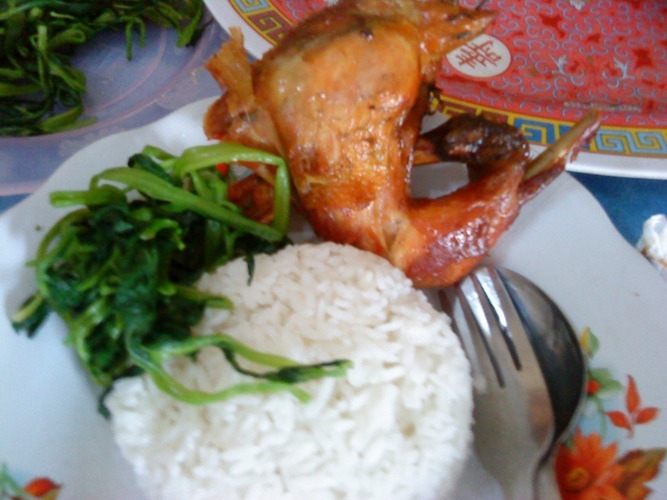 Ayam Betutu is one of the local Bali food. It has their own spice and sambal (very hot), makes the taste different than other deep fried chicken. Anyway, main focus of the tour this day would be “beach” which I have never been to. 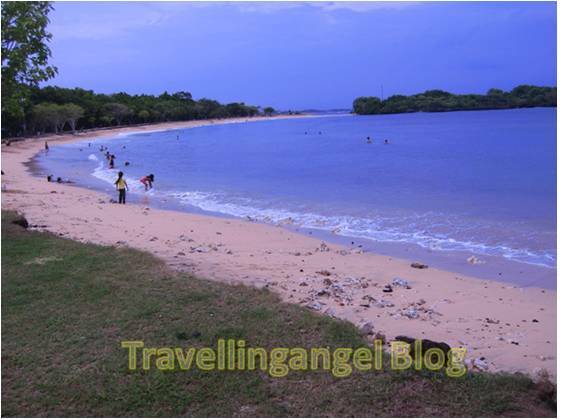 So after our stomach got full, we started the tour by visiting Nusa Dua Beach. I was so surprised seeing the beautiful white sandy beach on my left and also on my right. If you see Bali map, I believe you will know where it is. The wave was so calm that day so we could play with the water. There was also other tourist object called “Waterblow”, where you can see a water blown-up from the rock.. it was beautiful. 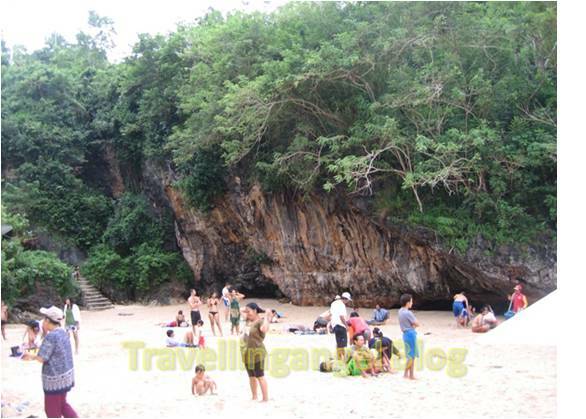 Then our next destination is Pantai Geger (Geger Beach). This beach reminds me of Dreamland Beach in Pecatu area but without the high rock. It is a very clean white sandy beach. Unfortunately, the beach was full with people, so I just took a picture and decided to go to the next destination, Karma Kandara. 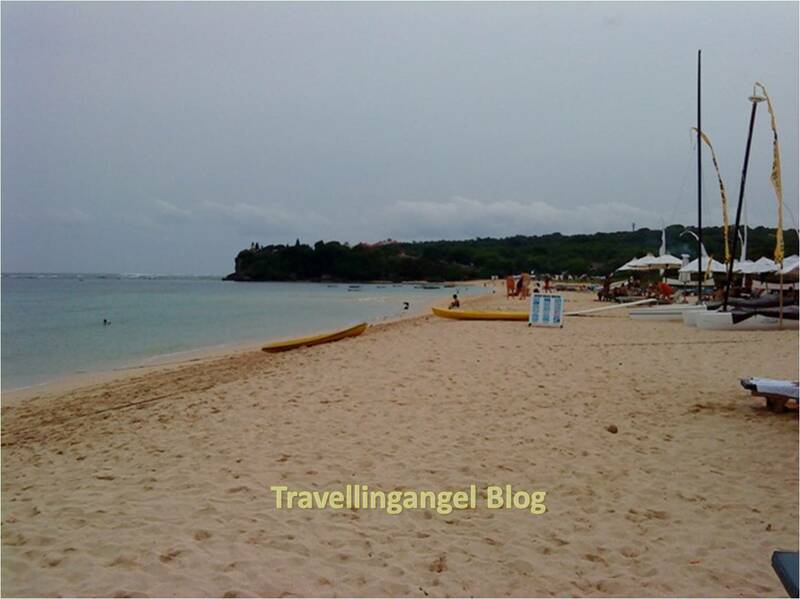 But unfortunately, due to limit of time, we skipped it and went straight to Padang-Padang Beach. It took about 1 hour to go there from Nusa Dua. When we reached the beach, we still have to pass this stairs between high rocks.. just like going in a cave and there at the end, we found a beautiful beach. There were no much people since it was about 4pm. The water there was so calm so we played and swam for almost 2 hours. I really enjoyed it, especially when thinking that Julia Robert was there when she did film-shooting of “Eat Pray Love” ^.^v. Got tired playing in the beaches, we finally felt the need of dinner. I asked the driver to take us to affordable local food resto. He brought us to the street near Joger Shop Kuta, it was Jl. Kahuripan if I am not mistaken. We ate at Bambu Sari restaurant. The food there is so delicious. I am saying this not because I was so hungry that time, but the Nasi Campur (mixed rice) was really perfect taste!! And the sambal was very very hot, but good !! The house special drinks were also as good as the food. The driver really know well the location of good resto. It was hard to be in this day because we would leave Bali the next day. There were still many things we wanted to do. Anyway, the morning went as usual by having buffet breakfast. I ordered the mixed omelet, tasted good, maybe because there was bacon LoL… then we went to Legian Beach for relax but for me, I went there for Body Board. The water was kinda scary actually, many big waves.. but it was good for body boarding. I remembered the driver told me about it, that the wave in west part was not friendly. That’s why Pantai Geger was full of people the previous day. Many tourists preferred going to east side beach with better waves and calm water.. Anyway, we spent quite long time in Legian.. We rent a beach bench there at my fave place in front of Kumala Pantai Restaurant. I use to rent the bench and body board there because their price is very reasonable. But I don’t think the rental guy notice that :p .. we also had lunch at Blue Ocean resto in front of Legian Beach (dunno if it’s the correct name). The taste was good.. the pizza was too salty though.. but the service was good. Very equal with the price :p Anyway, we were in the beach until afternoon. After got back to hotel, we tried a little taste of their good swimming pool. 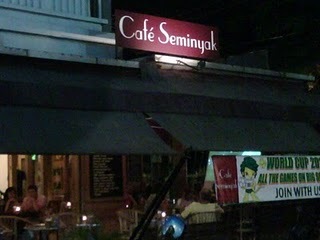 I wish I could stay there longer to enjoy it longer.. Then it came our ‘last nite’ in Bali, we planned it by having dinner in Seminyak café. The food there is not bad. 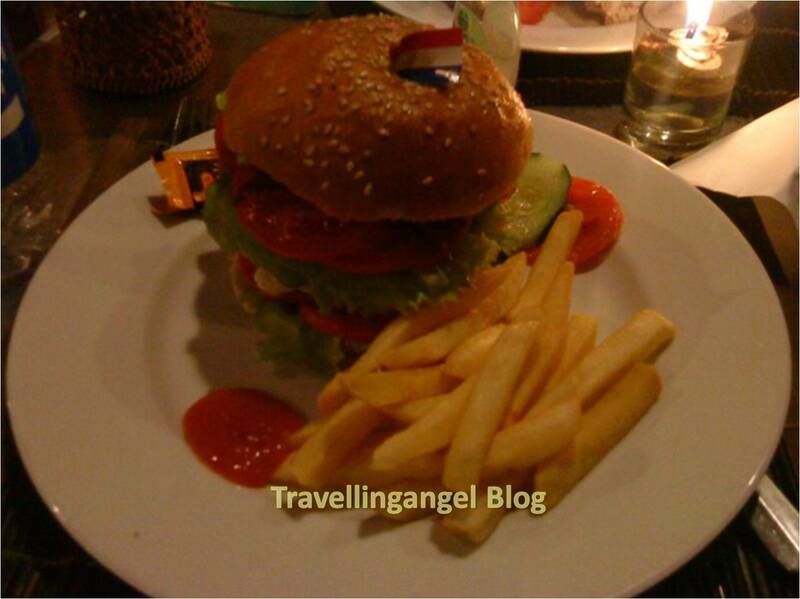 I ordered their famous giant burger, it tasted good but my stomach couldn’t eat it more. I was too full with my lunch. My other family ordered Tuna Sandwich and Fried Rice, both tasted good. Only my sister who ordered their chicken Gordon blue had to regret it.. too oily on the fried. I also ordered their Strawberry Pie and it was delicious. I would love to go back there and try it again next time. Well, the dinner went well. We had some souvenir shop at Bintang Supermarket, just behind this café, then walked back to our hotel. It is not close, but it is also not that far. Today my family and I had different destination. 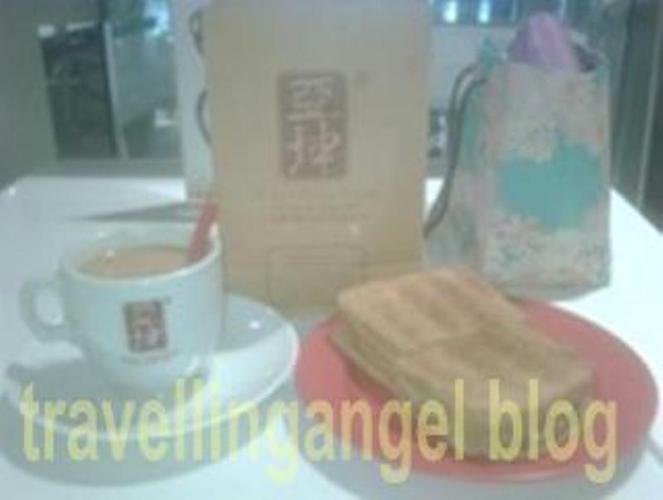 They were going to return to Jakarta and I was going to continue my journey to Singapore. My family flight was early morning so I booked an airport transfer, using Orchid Travel again. The price is not bad, Rp.70,000 using APV car. I knew the owner of this travel on the net and it was good that she made the time to see me that morning while picking up my family. She is a nice person and we have a common hobby ‘diving’ ^.^ I really thank her to have arranged the destination for me and show the beautiful beaches on Day 3. I couldn’t wait to be in airport, check in and go to Singapore.. I was almost late actually cause I spent too long in internet café and packing.. 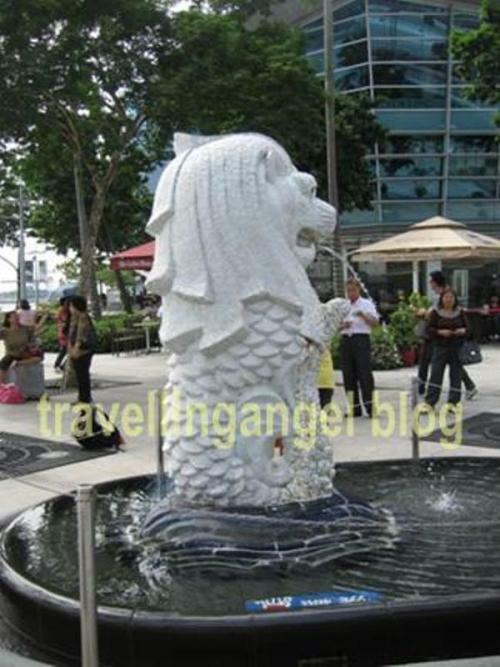 I was so thrilled and nervous because it was my first time to Singapore and also my first solo traveling overseas. My Air Asia ticket was actually for 2 persons but my cousin had to cancel very last minute. So there was me, checking-in by myself, got questioned by the immigration and airlines staffs about her.. she must be laughing when reading this.. also jealous… I guess hihihi..
My flight departed on time and I arrived in Singapore as schedule. First thing to do there was finding the money changer and the UOB to buy SIM Card and the MRT Ticketting office to buy EZLink Card. Air Asia arrived at terminal 1 so I had to take Skyline to Terminal 2, where there is MRT Station to the city. I looked for UOB and Money Changer and a little surprise knowing that UOB is a money changer which also selling SIM Card. I changed some rupiah and the rate there is Rp.250 higher than in Jakarta. I also bought Starhub Green SIM Card for easy communication with my friend. The starter pack costs S$15. Afterward, I went to MRT Office. Changi Airport is big and a nice place. I think KL Airport is better though but maybe the service in Changi is more complete. Anyway, I got the EZLink Card for S$12 and top-it-up with S$10. So I had value of S$17 in total, the other S$5 was the non-refundable card cost. But with this value, I could go to all destination I planned and yet, still had some balance at the end of my day. Anyway, I had appointment with my friend that time. She is a colleague from my office affiliates in Singapore. We went for dinner at Maxwell Hawker and had Tian-tian chicken rice. 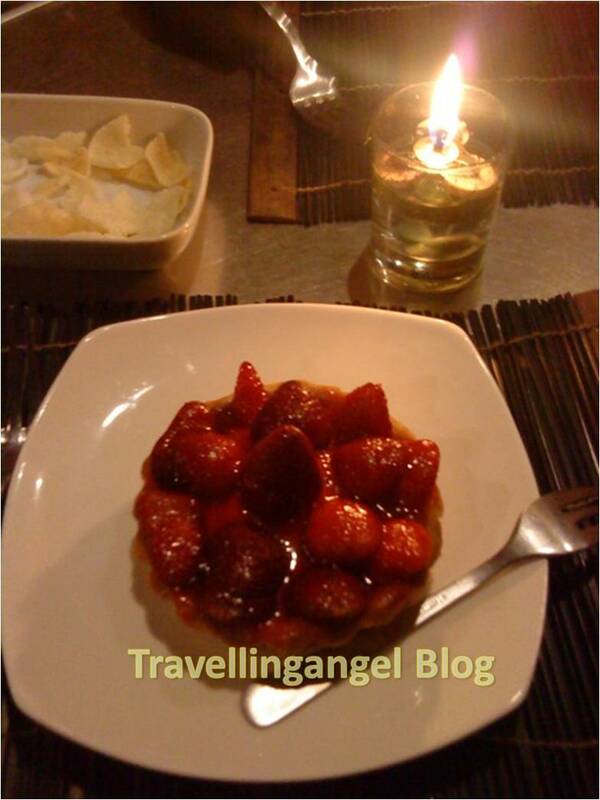 I chose this place following the good review of other travelers. But for me, that chicken rice tasted so so. Maybe because I am Indonesian and use to have very strong taste of food, while that chicken rice tastes very soft. After dinner, she taught me how to read the MRT sign. She’s very helpful. Then, I went to Vivo City to find this ‘Magic Scarf’. I knew it from my friend and bought one for me. 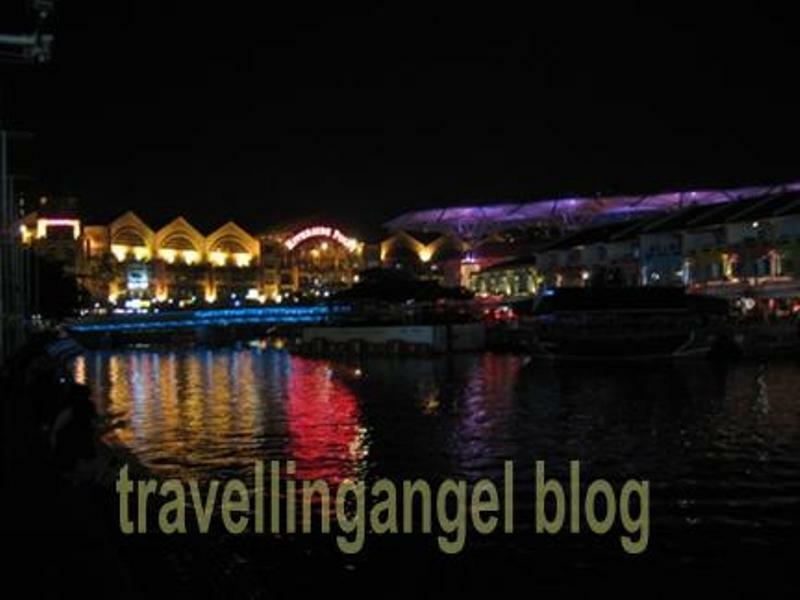 Vivo City is a big department store in Harbour Front area. 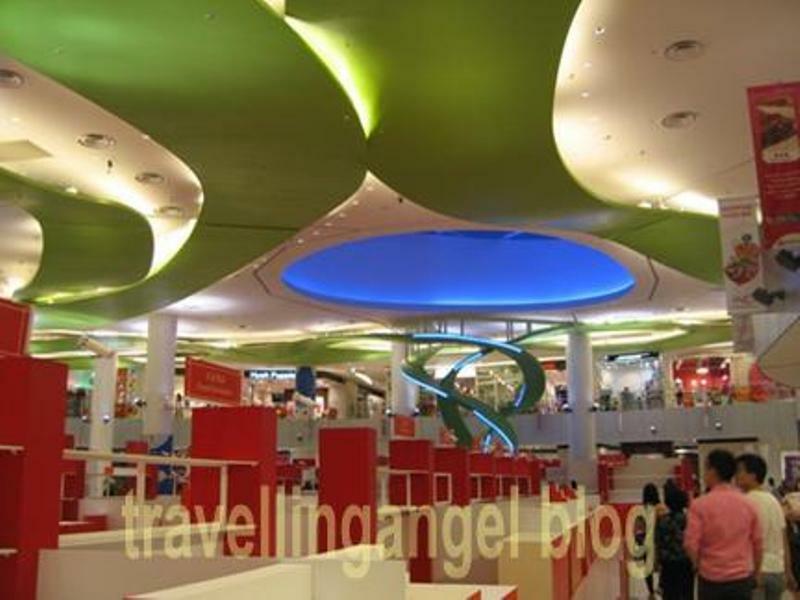 I think it’s similar with big mall in Jakarta so I didn’t really interest to explore it. 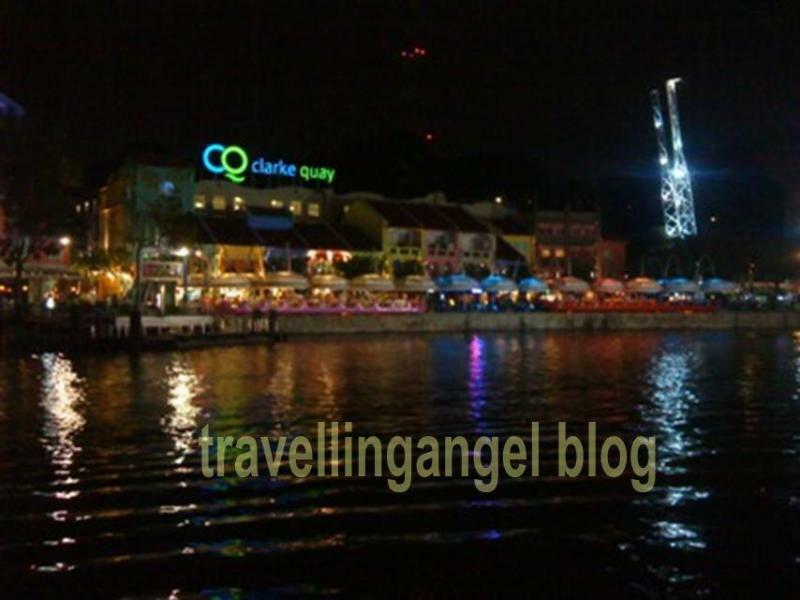 Next, I went to Clarke Quay. The view there was great from across the river, seeing the light from restaurants and cafés while sitting in the side of the river. It felt so comforting. I was there quite long, enjoying the view, listening to the house music.. all for free hehehe… afterward, I went back to Chinatown, saw some souvenir in the shops around my hostel, then finally back to hostel, clean up and rested at my bunk.. I woke up with a good feeling. My bunk felt so comfy that made me resting well ^^/ The hostel offers breakfast of cereal, bread, coffee/tea/milk.. You can have as much as you want. I tried the free internet also (they prepare the notebook) and the connection is fast. Very value place!! 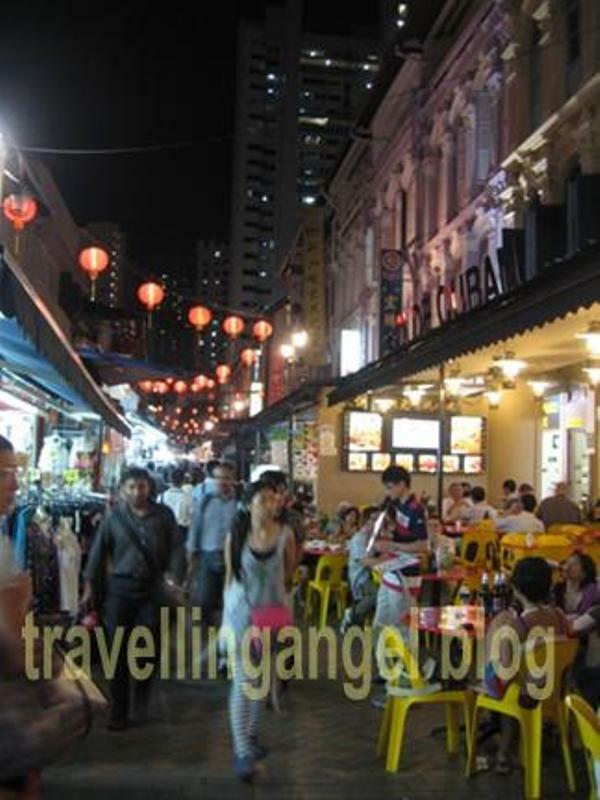 Anyway on day six, The plan is to stroll down the area in Little India, Raffles Place, Chinatown with its sightseeing referring to itinerary from wikitravel (“Three Days in Singapore“). 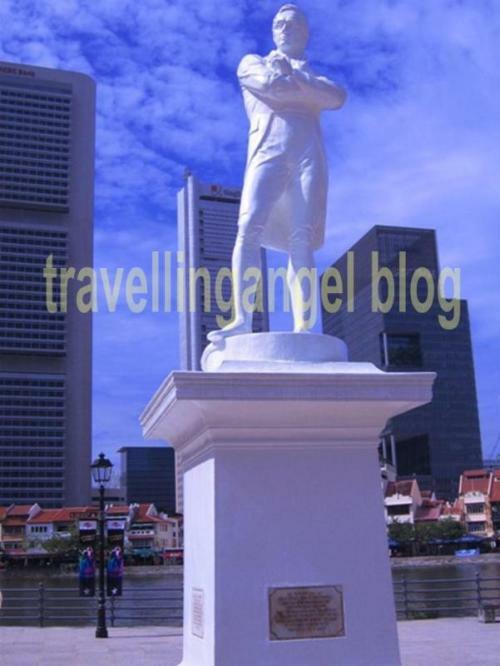 First destination was Raffles Place, this place has many high buildings, reminds me of Tokyo. 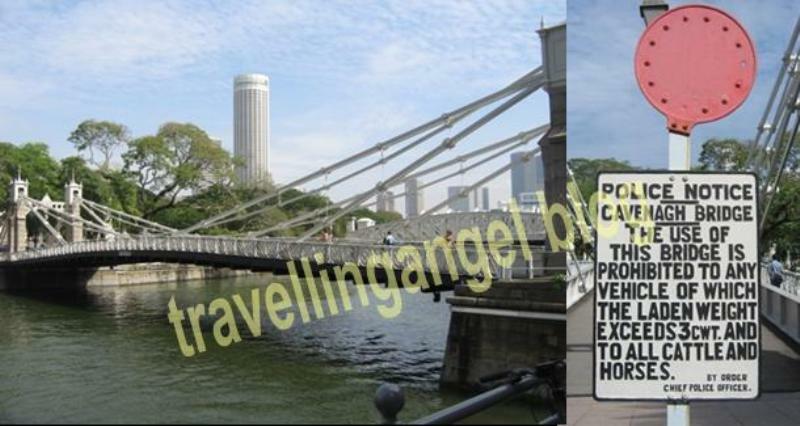 You can see the Cavenagh Bridge (oldest bridge that still standing, you should read the interesting sign board before crossing it), the white Raffles Statue (heard there is the bronze one near it but unfortunately I didn’t find it) and then the symbol of Singapore, Merlion Statue (Mermaid Lion). I though Merlion statue would be big but in fact, I am taller than it LoL .. I looked that statue for quite long so kinda disappointed hehehe.. but the view from that Merlion park is awesome. 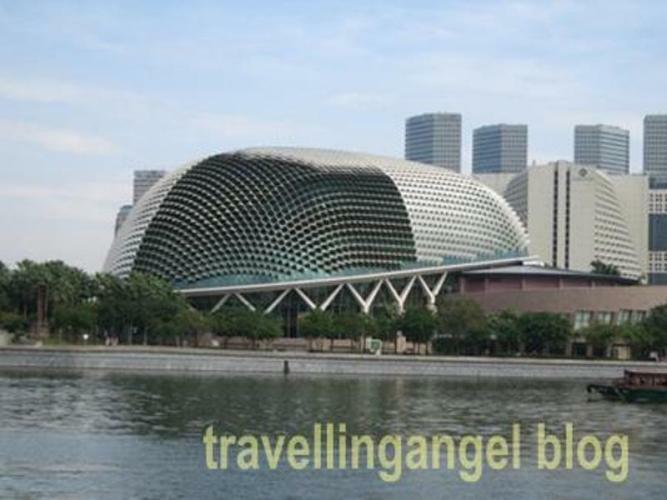 You can see the Marina Bay Sands Hotel (3 high buildings with a ship shape on the top connecting them) and Esplanade building (shape like Durian). 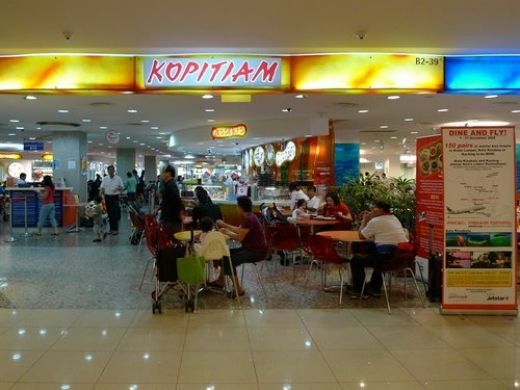 Lunch time, I went to Kopitiam Foodcourt at Vivo city Mall and had Roti Prata set. I like it. Finished with lunch, I continue to stroll down Little India. 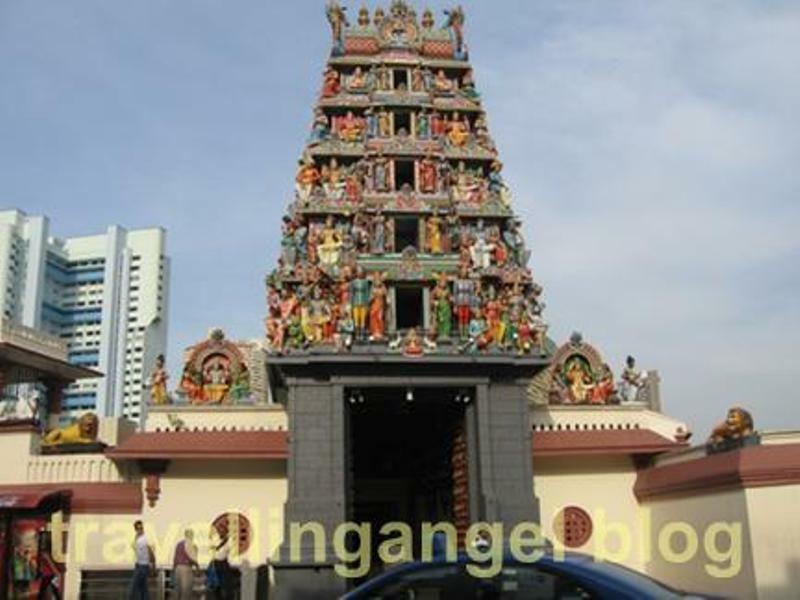 I walked from Little India Station exit until Farrer Park Station while seeing the Indian decoration on the street and its surrounding. 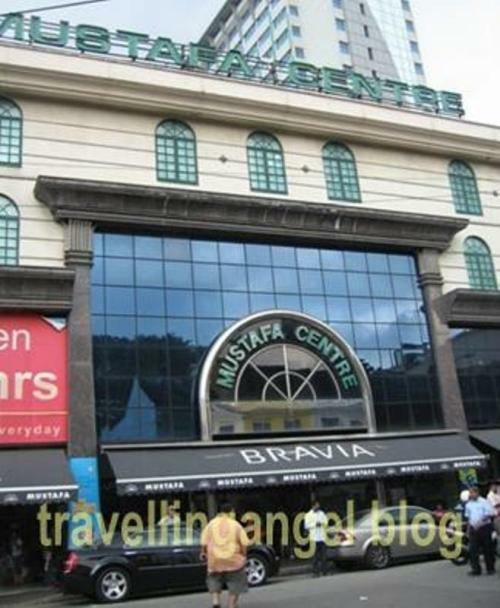 It is nice, many Indians there and there is this famous Mustafa Center near Farrer Park Station, where you can shop for 24 hours. It was my last day in Singapore. My flight was about 2pm so I tried to get the things I haven’t done in the morning which is a quick sightseeing around Chinatown and trying Roti Kaya. What’s up, after reading this amazing piece of writing i am also glad to share my know-how here with friends.